The Ethnography Group of the Museo Plasenia de Butrón was born with the basic vocation of inventioring, studying and publicizing the ethnographic heritage of Uribe Kosta. 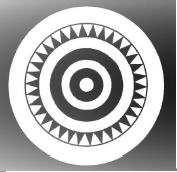 The stele of Larraganena, chosen as an icon of the group activity bulletin, is an emblematic symbol of the object of study that unites us and we believe that the launching of the group and its bulletin can be a good time to launch a initiative in accordance with our founding objectives. More information: Etnography Group (in Spanish). 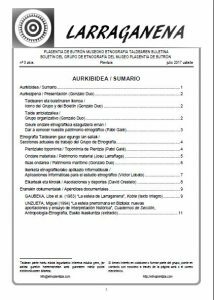 Download of the bulletin: Boletín Larraganena N.0 (in Spanish). 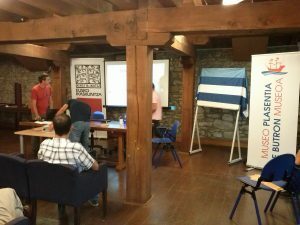 Conference on Local History, where the activities and the bulletin “Larraganena” of the Group of Ethnography were introduced. 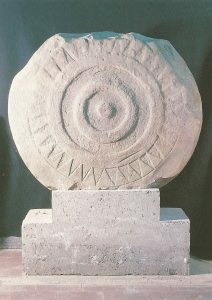 Stele of Larraganena (currently at the Archaeological Museum of Bilbao), and icon of the group. 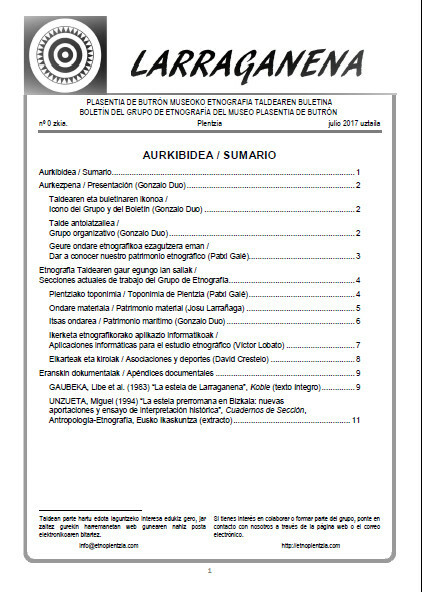 Cover of number 0 of the bulletin Larraganena.